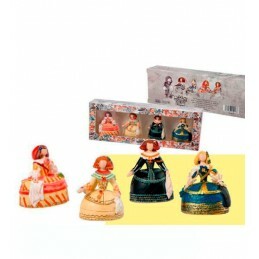 Las Meninas by Velazquez products There are 18 products. 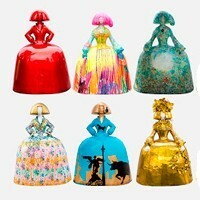 All kinds of souvenirs with a central themet the paint "Las Meninas" by the famous Spanish painter Diego Velázquez. In this section you will find figures, Hangers, mugs, playing cards... If you want to take a nice Madrid souvenir or gift events, corporate gifts or for groups. Set of two breakfast cups or mugs design "Las Meninas by Velázquez" the famous painting by Diego Velazquez. They come in a clear plastic box. Souvenirs de Madrid. Las Meninas manicure includes: nail clippers, scissors, pliers, file and tweezers. 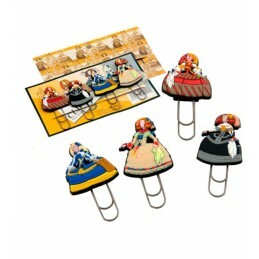 Las Meninas kit with five magnets figures from the famous Spanish painter Diego de Velázquez, located in the Museo del Prado. For the refrigerator, to collect, ideal as a gift of souvenir. Notepad with pen decorated with "Las Meninas" the famous paint from Diego Velázquez. Pocket notes or notebook with images of Las Meninas by Velázquez. Lined pages and elastic closure. Set of two coffee cups and two plates porcelain with motifs of famous painting Las Meninas by Velazquez in gift box. Measure 6.5 x 5 cm and the plate is 11 cm in diameter.